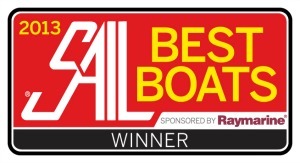 With 30 units built and sailing around the world, an interest for the brand increasingly pronounced and an international recognition by the specialized press (elected boat of the year in 2013, by Cruising World and Sail Magazine, nominated for the 2018 European boat of the year, and the multihull of the year), NEEL TRIMARANS launches the enhanced NEEL Trimarans’ 2nd generation. 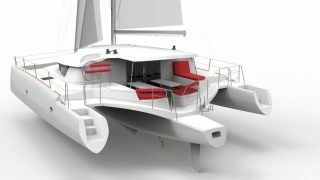 The NEEL 45 EVOLUTION will be launched at the International Multihull Boat Show (18 – 22 April 2018), in La Grande Motte. 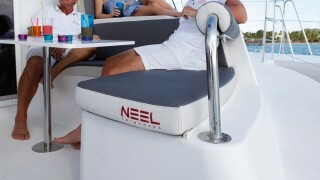 The NEEL 45 borrows many of its features from its successful predecessor, the NEEL 50, including its notable space, light, modern design, loft look, storage areas, speed, safety and comfort at sea. 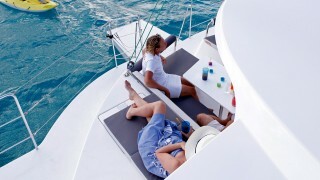 The NEEL 45 enjoys the same excellent privacy in the cabins, independence for the owner and crew who each have their own room, and amazing ambience in the spacious saloon, kitchen and cockpit. 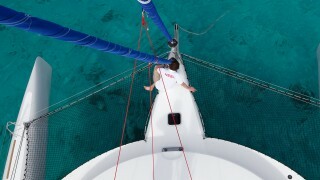 The NEEL 45 innovates by connecting the two wings with a living platform at cockpit level. Life aboard emulates a loft apartment with its central kitchen, saloon with a panoramic view, and its three double cabins and two bathrooms. 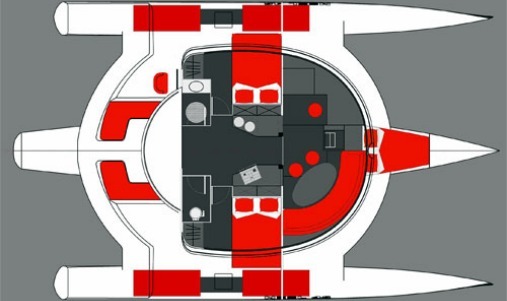 The entire main hull volume is devoted to equipment, engine, electronic and electric wiring, plumbing, diesel and water tanks as well as plenty of storage. The large space available in this storeroom (a remarkable 1.80m high) makes the access easier for all the maintenance equipment and for optional generator, desalinator or air-conditioning. 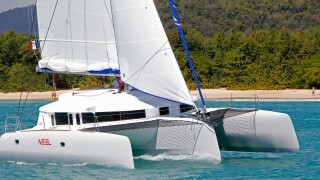 The trimaran proportions allow for a large roof, guaranteeing expansive interior volume. 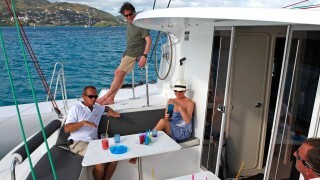 The NEEL 45 is resolutely innovative with its uncluttered exterior style and its interior decor. The NEEL 45 is designed for fast cruising, regularly sailing at more than 10 knots average, and covering 220 miles per 24 hours. 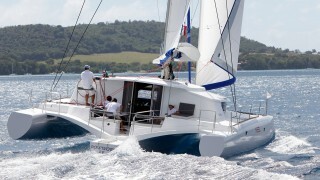 15 to 20 knots are often reached as soon as wind strength intensifies. 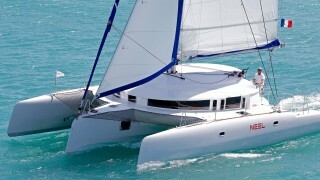 The NEEL 45 is fitted with the last innovations developed by racing multihulls, such as square top mainsail, Vectran shrouds and forestay, reef hooks, genoa stocker and carbon rudder. 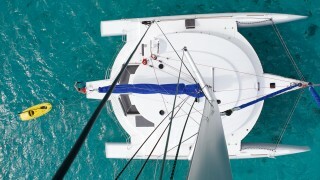 Weight distribution is centred, which limits pitching, and the main hull roach facilitates tacking. On the other hand, the float’s shape is tense in order to favour stability and hull centre progress according to the sail loading. 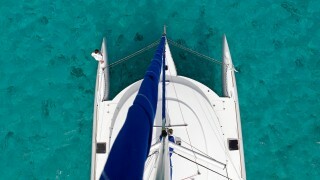 The sail area is generous with 170sqm per ton. 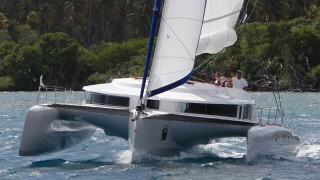 Finally, the trimaran is also impressively fast under power as the main hull prismatic coefficient creates a very low drag. Moreover, the lateral floats are only very lightly touch the water’s surface. 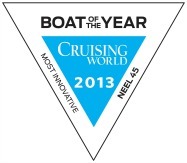 The innovative NEEL 45 trimaran has been awarded the Best Boat in the 2013 Cruising Multihull 41 – 50ft category.